The most popular solution for HIPAA compliance. Compliancy Group is the industry leader in HIPAA compliance software. Our team is composed of HIPAA experts, here to educate you and your staff about everything required of them under federal regulation. The Guard is Compliancy Group’s simple, cost-effective software that addresses every aspect of HIPAA compliance under the law. Our proprietary Achieve, Illustrate, and Maintain methodology, alongside support from your dedicated Compliance Coach, helps you satisfy the full extent of HIPAA, HITECH, and Omnibus regulations. In the past, achieving HIPAA compliance was a challenging and overwhelming task. Compliancy Group’s HIPAA software gives you confidence knowing that you’ve addressed the entirety of the law so that you can focus on running your practice or business. The Guard is an advanced, cloud-based solution that combines the knowledge of our skilled HIPAA compliancy experts, with a simple, easily-accessible technology. Find out how you can quickly become HIPAA compliant by scheduling your live one-on-one demo of this HIPAA software now. You can even get your HIPAA Compliance Checklist for free on our site. A Security Risk Assessment alone will not make you HIPAA compliant! Then you get everything you need to remediate gaps. The Guard has built-in policy and procedure templates that are customized to the unique needs of your practice. The Guard™ provides annual HIPAA training to educate you and your employees about the importance of HIPAA compliance–but it doesn’t stop there. The real headaches of training come with managing who’s been trained, when they were trained, and how to track and prove that they understood the training they received. Our HIPAA software has built-in reporting that tracks each employee’s training. The Guard also tracks employee attestation to the training they receive, recording the completion status and the completion date so your staff will always be up to date. The Guard™ is the only HIPAA compliance software on the market to offer HIPAA Seal of Compliance Verification™ for your compliance program. With the Seal of Compliance, you’ll be able to demonstrate that you’ve satisfied the full extent of the federal regulation. Display the Seal of Compliance on your website and in your physical locations to proudly show your dedication to HIPAA privacy and security. HIPAA violations and government fines are making the headlines every day, and your patients and clients are more educated about the law than ever before. 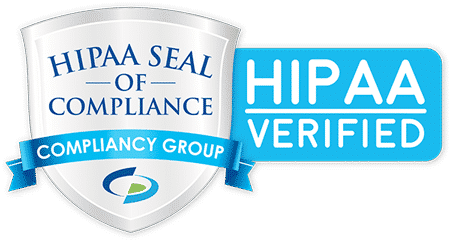 The HIPAA Seal of Compliance is a powerful way to verify your compliance and differentiate your business from the competition. Incidents happen! Count on The Guard™ to give you a simple means of completely tracking and reporting all security incidents as they occur. The Guard is built to address each element of the federal regulation, including increasingly important protocols for incident management. In January of 2017, OCR levied its first ever fine for lack of compliance with the Breach Notification Rule, signaling more stringent enforcement on the horizon. We cover all the HIPAA compliance software requirements taking the stress out of incident management so you can get back to running your business. The Guard™ is a web-based portal that allows you to assess and manage your vendors and Business Associates all from one location. Business Associate Agreements must be signed and executed each year with all health care vendors. Templated agreements come stored in The Guard with your subscription, saving you the time and money you’d otherwise spend with a HIPAA consultant or attorney. The Guard also simplifies due diligence, giving you the tools to assess the ongoing status of your vendors’ privacy standards, security infrastructure, and HIPAA compliance year after year. Compliancy Group’s team of expert Compliance Coaches ™ are ready and waiting to guide you through data breaches and OCR investigations, should they arise. Our Breach Support Staff is on call to provide all of the necessary reports and documentation for your practice or organization to confidently get through a data breach incident. With our ongoing support, you’ll be given the tools to maintain your compliance year after year.